The current redevelopment of Lan Kwai Fong got us thinking about some of the former occupants we’d merrily supped at over the years. Though the area is not historically known as a hotbed of culinary talent, one name that stood out was Café des Artistes, a long-gone soupcon of Gallic charm amid the beer-swilling madness. As fate would have it, just as the wrecking ball was moving in on Café des Artistes’ erstwhile home, California Tower, its former executive chef – Didier Rochat – was opening a new spot in Noho. 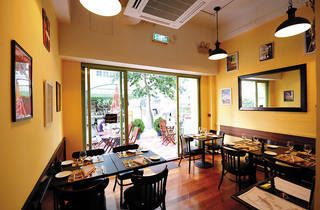 Occupying the space formerly taken up by Cage, the simply named Didier is a cosy neighbourhood eatery serving French Provençal cuisine. 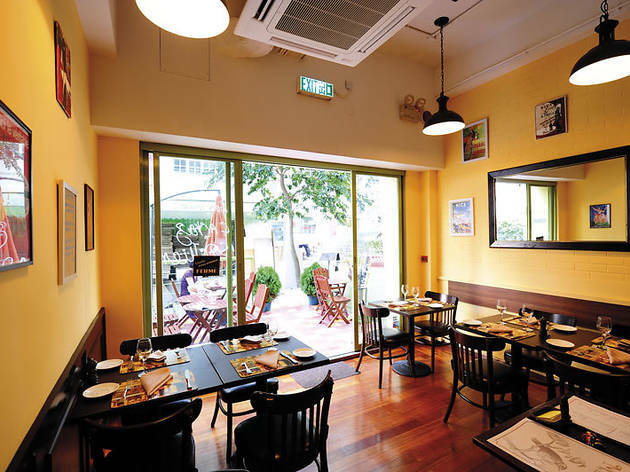 Out front is a small terrace, from where jovial French voices and puffs of cigarette smoke drift up the steps to Hollywood Road, while inside the décor is casual, quirky and très typique. Rochat, a native of Provence who has also plied his trade at La Brasserie at the Marco Polo Hotel in Tsim Sha Tsui, helms the kitchen while meandering in and out to chat to customers and make recommendations. Sporting an impressive array of arm tattoos, Rochat is more Anthony Bourdain than Alain Ducasse, and his food is of the unpretentious, homey variety. The menu offers six starters and nine mains (four fish, five meat), plus a handful of daily specials. We elected to start with the pan-seared goat’s cheese ($90), plus the spinach soup ($55) from the specials board. The goat’s cheese, accompanied by almonds, onion jam and a small salad served in a charming mini plant pot, was wonderfully creamy, the surprisingly subtle flavour of the cheese pairing with the sweet-tartness of the onion jam. The soup, meanwhile, was nourishing, verdurous and strong on the salt, but in a good way. We practically licked the bowl clean. We couldn’t fault the starters, but mains didn’t quite hit the same heights. The whole braised fish of the day Provençal style (seabass; $165) was cooked well enough, but the sheer number of tiny bones made the eating of it a laborious and treacherous process that was not well enough compensated by the flavours. The stewed rabbit with mustard and mushrooms ($160) fared better, two large cuts of succulent bunny swimming in a rich and flavourful sauce, with a creamy swirl of potatoes on the side. About halfway through we started to find it a little too rich for our tastes, but we’re quite sure that many will find this dish right on the money. For dessert, the Provençal flowers pollen crème brûlée ($75) offered a slightly unusual take on the faithful standard, while the frozen nougat with fruit confits, honey and lavender ($70) was a rich and gooey mess, but pleasantly so. The service was friendly enough if not exactly flawless, while the wine list is small but sufficient. And though they may still be working out some kinks, judging by the number of French people in attendance on our visit, many of whom seemed to be regulars, it seems like Didier has already found its niche. 3 Mee Lun St, Noho, 2217 3389. Mon-Sat 11.30am-midnight. Meal for two: around $750. Lunch from $98 per person.